Not all ceilings are created equal. Make sure that the support beam or joists in your ceiling will support the weight of the porch swing and its occupants. If you're unsure of your ceiling's strength, have an experienced carpenter check it out. Once you're sure, drill pilot holes to prevent wood splitting, screw eye-bolts or large hooks into an overhead support beam, and hang your chains. 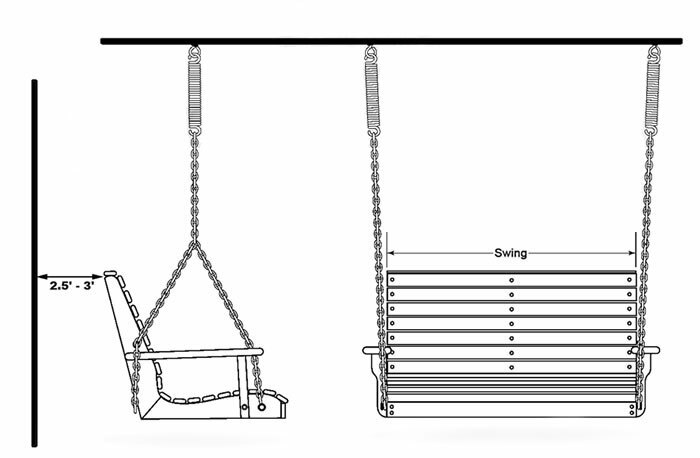 For crash-free swinging, leave a minimum of 2.5 feet behind the swing for ample swinging room. Three feet or more is even better. Position the swing chains an inch or two outside the swing length to efficiently disperse the weight. For example, when hanging a 5-foot swing, position the ceiling chain hooks about 5 feet 2 inches to 5 feet 4 inches apart. If you're using our comfort springs for extra bounce and smooth swinging, they hang (either side up) between the hanging hooks and the swing chains. Wimpy tree limbs won't support a porch swing. Choose a strong, sturdy limb when hanging your swing. Protect the limb from abrasion by padding the hanging chains with a rubber hose. Then fasten the chains around the limb with a heavy, rust-resistant bolt, remembering to add an inch or two to the swing length when positioning the chains. Keep your tree happy: never use hooks to attach a chain directly to a tree limb. If you discover that your ceiling can't sustain the weight of your porch swing and you don't have a sturdy tree limb to hang it from, you might try a free-standing A-frame swing package. They come with a stand for convenient placement anywhere on the lawn, in the garden, or on a large porch or patio surface.